My six year old is constantly talking about death and how he’ll die soon and it worries me. He doesn’t seem afraid of death; he says he’s going to heaven. I’m concerned, though. What do I do? I would sit down with him and try to figure out what’s on his mind. You never know what’s going on in those heads of theirs. Someone once told me that somehow he hadn’t gotten the picture that he’d lose his baby molars a few years after this front baby teeth, so when they started getting loose, he thought he was going to lose all his teeth and be toothless for the rest of his life. He didn’t tell his parents about his fears, either. Poor kid. It’s best to find a time to talk alone. Driving in the car together at night is an easy time for kids to talk about things they’re embarrassed about. Perhaps you could run an evening errand with him? Then listen. Take whatever he says seriously. Often kids will raise a trial balloon – share something minor to see how you’ll react before they share what’s really on their minds. Respond kindly and with concern. Don’t freak out, but don’t blow it off, either, even if it seems silly. What if he doesn’t talk? If he’s not spontaneously sharing, then you need to ask more questions. You’ve got to be sure, though, that it doesn’t sound like an interrogation. Sometimes a minor health symptom (like the teeth) can make them think something is seriously wrong. Kids can be frighteningly heroic. We’ve heard of kids who’ve endured awful abuse because they thought they had to in order to protect threatened family members. May sure no one is threatening them. It’s normal for kids that age to suddenly realize there is an unseen spiritual world out there with God and Satan and angels and demons in it. Some are pretty frightened by that. It’s a great time to reassure them that God is sovereign and that God is not just powerful, He is omnipotent – He is the most powerful being of all. That means we don’t have to be afraid of evil. God is stronger than any evil and He is love. 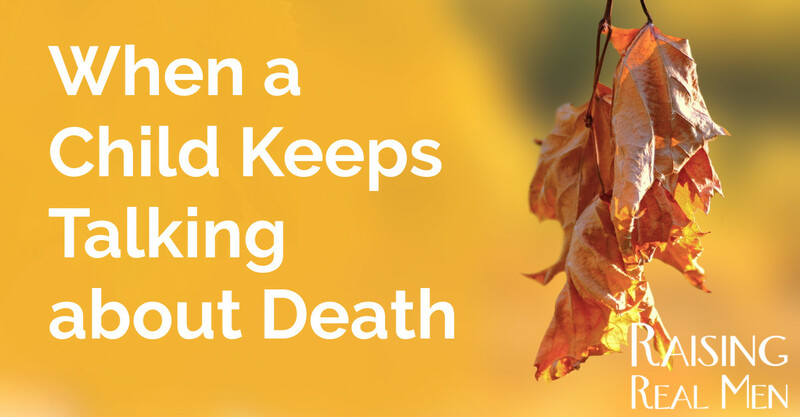 If there’s been a recent death in the family, among his friend’s families, or even the loss of a pet, it may just be that he’s really noticing death for the first time and needs to talk through it with you. Share with him the best comfort of all, that God loved us so much, even while we were sinners, to send His Son to die in our place. When we repent of our sins and trust in Jesus, we’re forgiven and we have eternal life. That’s good news indeed. “Son, if you are trusting Jesus as your Savior, you’ll go to heaven when you die. You need to remember, though, that we love you! We don’t want you to go to heaven for years and years and years. This is would be more serious if it were a teen or preteen. Although it is very unlikely in a six year old, if you are reading this and your child is a teen or preteen, you need to ask yourself if this is a suicide threat. If you get any sense at all that it is or if your child is on a medication that can cause suicidal thoughts like some anti-depressants, you need to get help. Suicide talk is an emergency. It’s a cry for help. Get him help. Don’t leave him unsupervised. Talk to your doctor. Whatever you do, don’t ignore it. With a little guy, though, you’ve just got to figure out what’s on his mind and help him to work through it. That’s what parents are for. May the Lord give you wisdom to know how to help him out. Yes, in older children such a question could be very dangerous. Here’s an article I wrote on Preventing Suicide recently. It might be an idea to share it with your readers because most parents have no idea what to do when their own teens or their teen’s friends become depressed. Thank you, Annie Kate! Good article. People don’t realize how serious talk of suicide is. I’m glad you addressed it so clearly! A good article. 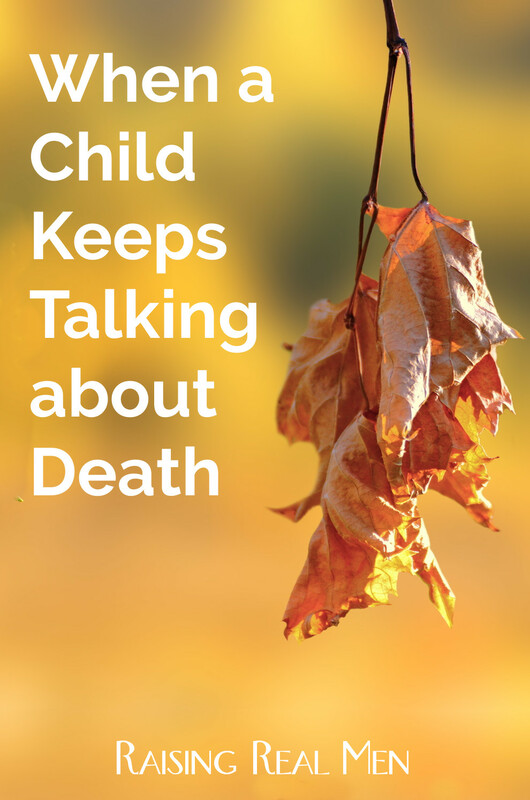 We have recently had a couple family members die and death has been a big worry for my kids. We mostly hug a lot and talk, but sometimes I feel like I should be doing more. This is hard to help kids through. It sure is! I’m thankful you are there for your kids. I’m posting anon to be respectful of my child’s privacy. We did have a kindergartener with anxiety/depression that showed in death talk, among other things. We were able to get great play/talk therapy as well as medication. It was very scary for me, as a mom, to see serious mental health struggles in my child. In retrospect, we handled it was we knew how at the time. I wish we had talked with our pastor about it more. I wish we had prayed more. 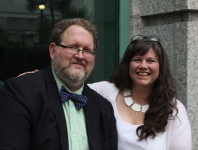 I wish we had continued therapy longer — and got more help for ourselves as parents ($ was an issue.) I wish we had been more consistent with the medication. Thank you for sharing your wisdom and encouragement! I am so glad you got your little one the help he or she needed. How hard to deal with that in such a little child. Thank you for sharing — it may help a parent facing the same thing!